This week I'm playing with a great chipboard piece. 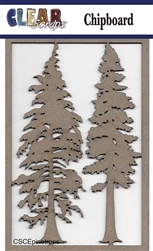 It comes in a set of two different trees, and I used one of them on my card. I began by coloring the chipboard tree with Distress Oxide inks. I used Vintage Photo on the trunk, and Peeled Paint on the rest of the tree. The background of the A2 card was misted with Dylusions London Blue. Once it was dried, I adhered it to a dark brown card base. and then stamped the sentiment in place, using black ink. The sentiment is from a Bible journaling set. Whenever I work with trees, Psalm 46:10 comes to mind. and then gave a light misting of water over the whole card. Clear Scraps has so many fabulous chipboard pieces! and there are so many options for coloring them. Here's one final look at the finished card. Stamp: American Crafts - Bible Journaling. This is really beautiful Nancy ! Love the chipboard trees and wonderful sentiment. Your background is amazing, love the the blues and greens really beautiful and peaceful! GORGEOUS!! How VERY Beautiful Nancy, I find it quite contemplative. I love it all. Beautiful card. Love how you colored the chipboard and love so much the background. Fabs. Beautiful background! I adore that chipboard tree and that fabulous sentiment!